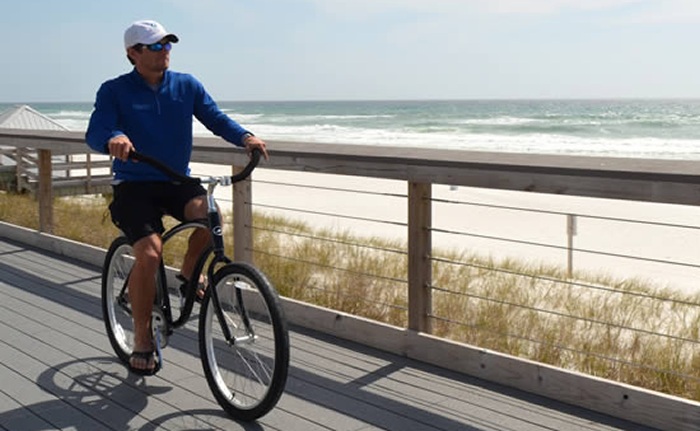 There are many to places for bike rides in the Destin Miramar Beach are. As a matter of fact a Bike is a perfect way to get to know the area. Most of the subdivisions are gated, as a result are relatively safe.Those that are not gated have strict speed limits. Not to mention the local Sheriffs who regularly cruise the neighbourhoods. Another key point is, the terrain is flat. Not to mention the cycle path which is adjacent to the stunning Gulf. A Garden Cottage, there are spectacular views. To the left will be the spectacular Gulf. You can stop of for lunch or a beverage. Offers tasty sandwiches and a full restaurant menu. On the other hand, park your bike and visit their beach bar. Granted you may not get any further, on the positive side there’s always tomorrow. To put it this way, you can explore further at your leisure. Different from than the others but still fantastic. Not forgetting to mention their Happy Hour. Lots of TV’s so that you can watch your favorite Football or Baseball game. To be sure, some of the best seafood in the area. Taking your bike further there are spectacular views of the Gulf, other restaurants with amazing views.